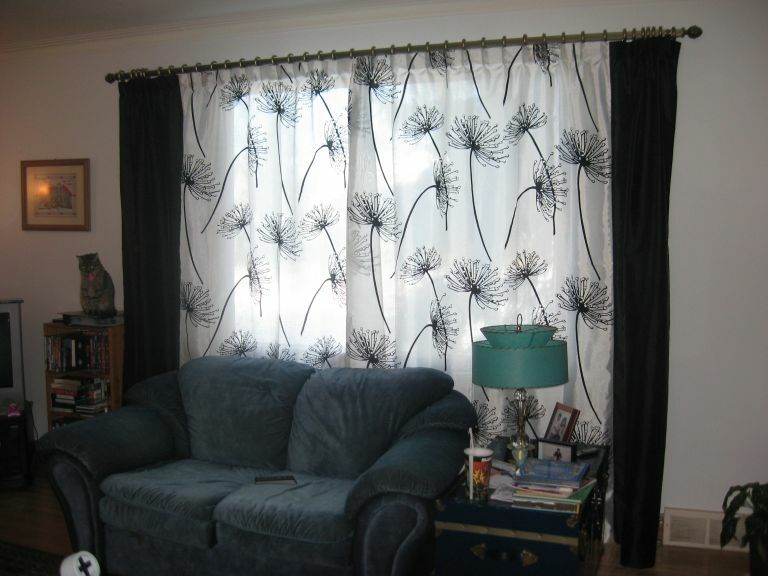 Life Candy: it's curtains for you, uh, house. it's curtains for you, uh, house. Now, keep in mind that I'm a knitter/crochet-er. I make gorgeous crap with yarn, yet when sewing, I'm a spaz. Oh, let's face it, I'm an all-around craft spaz. Need I remind you of my non-zen origami fiasco of 2010? Yeah, that wasn't pretty, and neither was my house this week. It looked as if the sewing section of Walmart threw up in my diningroom. Black and white thread everywhere. Scraps of fabric and bobbins crammed in inappropriate places. And I still can't find my seam ripper. But really, if we wanted to save over $1600 (would you like my firstborn too, Sear's drapery department people?! 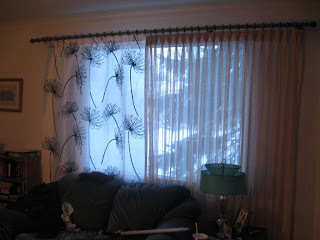 ), I had to buy inexpensive ready-made curtain panels, rip 'em apart, bring all the ripped bits together, and magically make them look better and not mangled by Ms. Craft-Spaz. Oh, the things I do to save a buck. Project #1 was a curtain for Mini's new loft bed. She chose both fabrics herself. 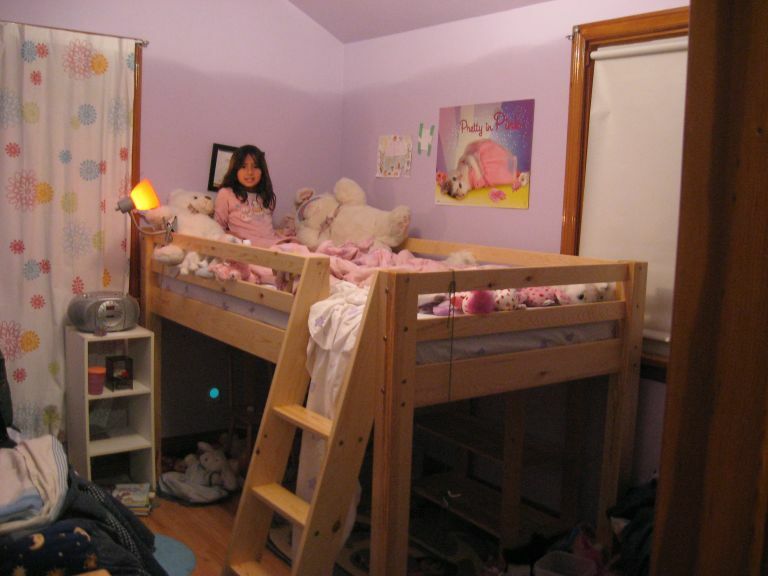 And she loves the finished product -- and the fun new place where she can hide her crap. Project #2 was much more involved and long overdue. After suffering the same old mind-numbing beige sheers on our livingroom window for 8 years, I decided to sew a brand new, more privacy-preserving set. I figured our neighbours were probably sick of watching us on "Naked Cartwheels and Interpretive Dance" Thursdays. Just kidding. They're on Wednesdays. The catch with these curtains is that they're on a special track, need curtain hooks to hang off said track, and need pleats sewn into them for the curtain hooks. PLEATS. Dang! Stop laughing. <sigh> Yes, it looked like crap from the outside (okay, from the inside too), but if my neighbours can survive my dumping mulch all over my lawn in 2006, they could survive this. But already, it was looking less sheer-curtain poo-ish. Roomie even said it looked "fresh". After the dust settled and the "it's so old, it doesn't have a reverse lever" sewing machine was put away, my curtains were finally fit for display. Gorgeous, non?! I like you did a fabulous job! At least, you CAN sew. I can't but wish I could so bad. I think the curtains look great but yes, now you need a new couch to go with the fantastic looking drapes. 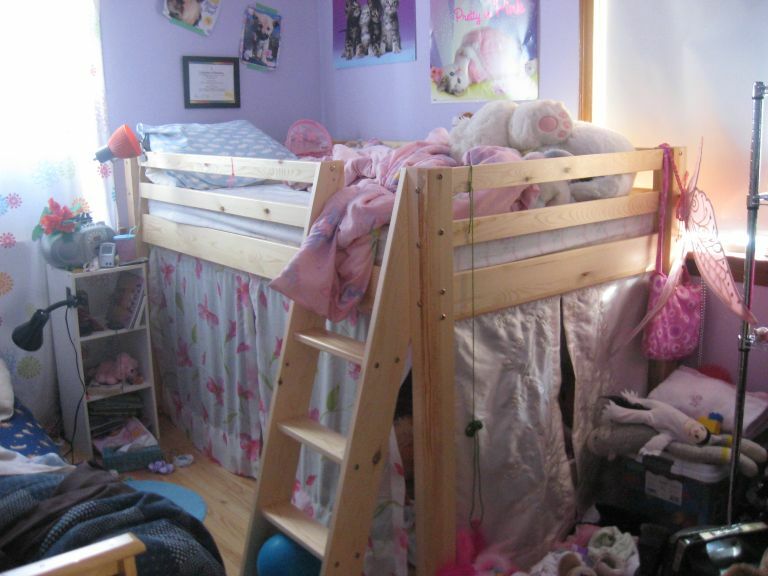 Cool drapes you made for your daughter's bed! Love the idea! the carpet matches the drapes! Excellent job! They look lovely. It looks awesome! You did a fantastic job!